Westar Marine Services is committed to safety in all phases of our operations. We fully comply with all applicable laws and regulations. Our company safety program supplements existing safety standards as a means of providing additional protection for our employees, the environment, and our cargo. As a condition of employment, every Westar Marine Services employee is expected to give his or her full support to promote safety. We believe that all accidents are preventable by establishing rules and safe working procedures exercising good judgment, and using common sense. Preventing accidents will prevent injuries and death. All Westar Marine Services employees are responsible for protecting themselves and contributing to the protection of their fellow crew members, the environment, and the equipment for which they are responsible. The individual is always directly responsible for his or her immediate actions, or inaction, and is therefore the only person who can guarantee his or her own safety. Maintaining a positive attitude toward safety and staying alert to issues regarding safety is the responsibility of all Westar employees. 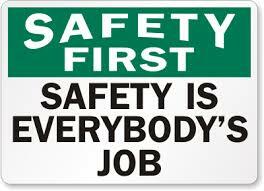 Safety policies or procedures are always subject to amendment if an employee has a suggestion for a better way. Everyone is encouraged to participate in the development of new procedures, or revisions to existing procedures by making recommendations to the Westar Marine Services’ Safety Officer, Port Captain or General Manager. Each vessel safety meeting, drill, or other training session should provide such opportunities. In addition, each vessel has copies of the “Safety Suggestion Sheet” to document recommendations. This form can be used to make anonymous written suggestions to further encourage employee participation.